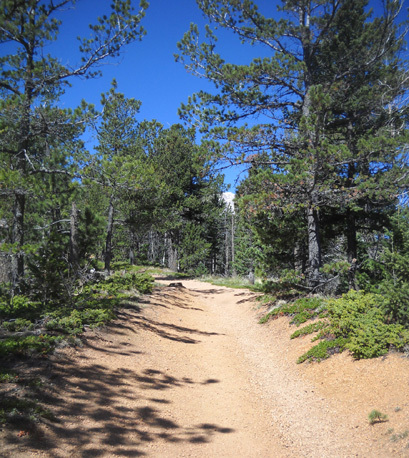 And one of the things I love is hiking up Pike's Peak . . . or any big mountain, for that matter. From what I've been able to ascertain this weekend there is still a lot of snow above 11,000 feet on Pike's Peak, with some remaining lower than that in shaded spots. 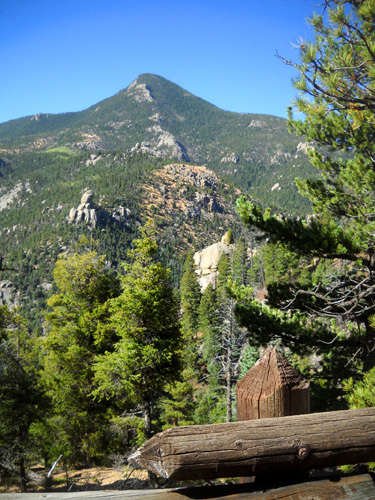 My goal today was to hike up at least as far as Barr Camp at 10,000 feet. 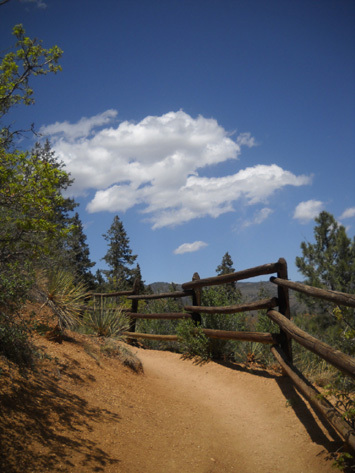 If I had time, wasn't too tired, and the trail was clear enough, I'd try to go higher. 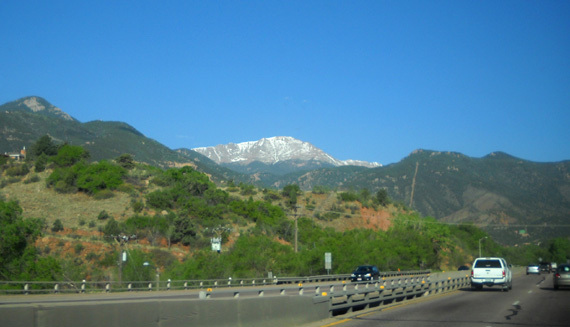 Snowy Pike's Peak beckoned in the distance as we drove toward it on US 24 this morning. I really wanted to get high enough to find some snow for Cody to play in. Alas, it took us so long to get to Barr Camp that we turned around there without seeing any snow. But we still had a (mostly) good time! I'm including enough photos in this entry to have several pages so they load faster. 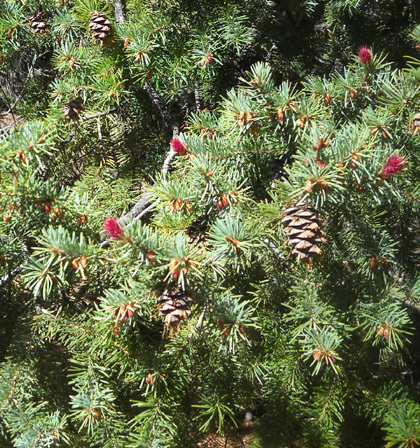 All of the pictures are from today's hike in gorgeous weather. Most of them are in order going up and coming back down. WHERE DID ALL THESE PEOPLE COME FROM??!! 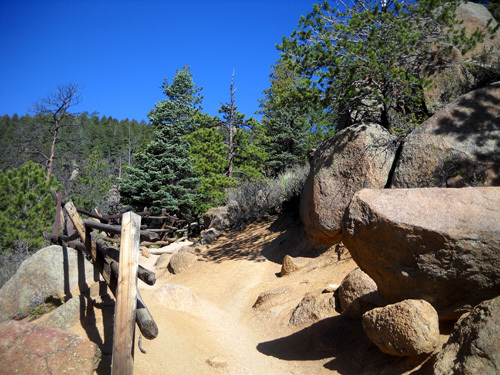 I've been on the Barr Trail enough times to know that it is extremely busy on warm weekends and holidays, especially near the trailhead in Manitou Springs. 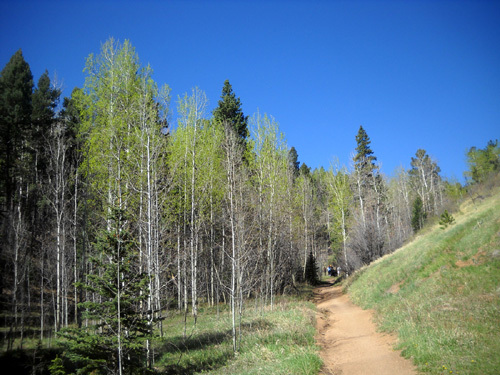 Many people get there early to either run/hike up a certain distance and back down, or to walk up the ridiculously steep Incline and run back down the trail. That made the first couple of miles pretty frustrating to me today. 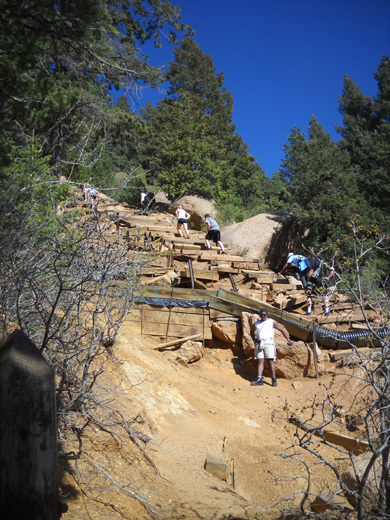 My timing was poor; I should have started at 6 AM, not 8, and then I could have gotten farther up the trail before all those studs came running back down from their Incline loop. 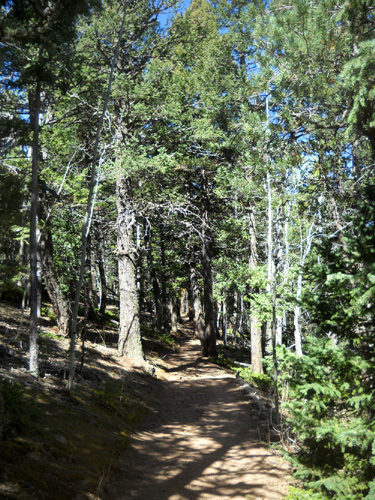 Barr Trail; this is the first and closest one. Many continue farther up. 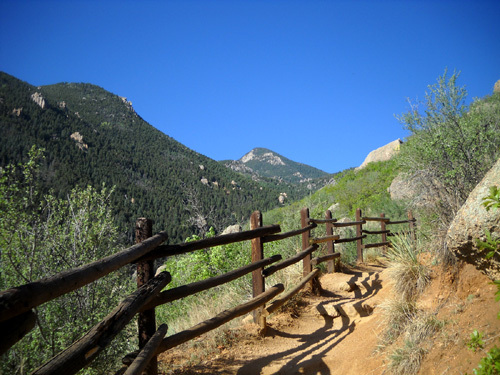 When Jim dropped Cody and me off at the trailhead in Manitou Springs the parking lot and much of Ruxton Street were packed with vehicles whose occupants were on the trail already or were going up the cog railway to the top of Pike's Peak. 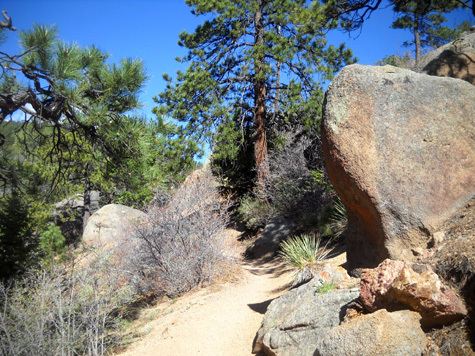 It took me longer than usual to walk up the first 2� miles of the Barr Trail on Rocky Mountain and Mount Manitou, two of Pike's eastern slopes. 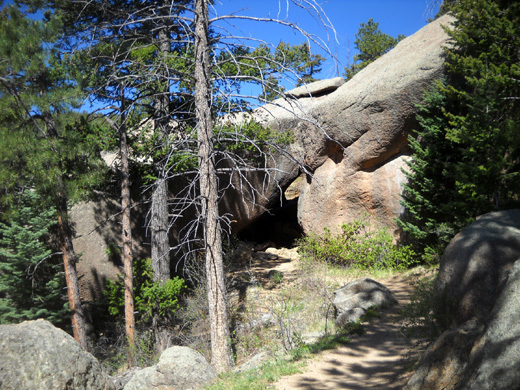 There is another trail leading from the top of the Incline to the Barr Trail at this point. 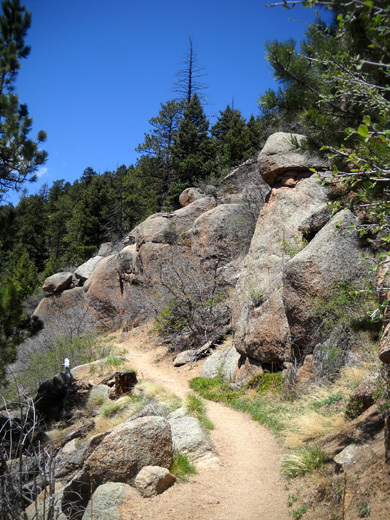 Most Incline-climbers get on the Barr Trail for a fast descent to the trailhead (they do a loop) rather than going back down the steep Incline steps. There were so many runners coming down at breakneck speeds that I had to frequently hold Cody off to the side of the steep, narrow trail to avoid getting run over. Two-way traffic is difficult in some places. 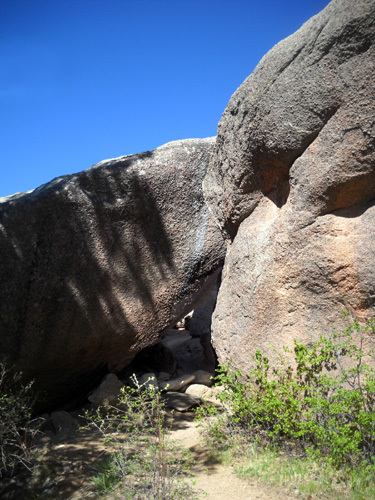 Fortunately, we had a very pleasant climb from there to Barr Camp. 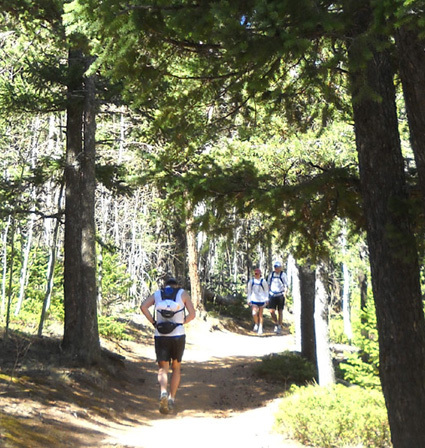 The runners going up and down between two and six miles were more likely training for the Pike's Peak Ascent or Marathon this summer. They were spread out farther, running more slowly, and behaved with much more decorum. In the early afternoon, the tables were turned and I was the unlikely speedster. 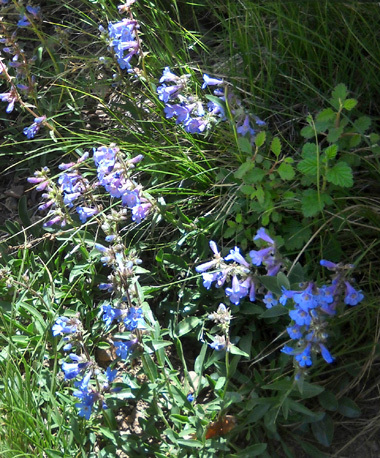 I was frustrated again when I was going back down the last couple miles above the trailhead. 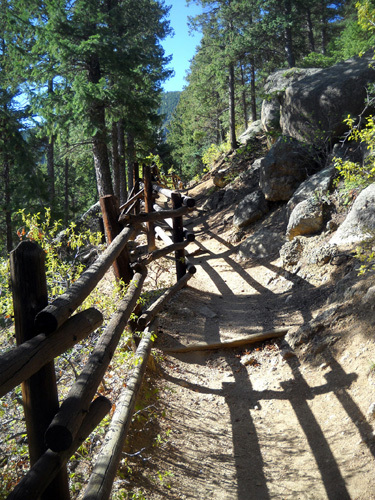 By then the Incline runners were mostly gone and the casual hikers were out. 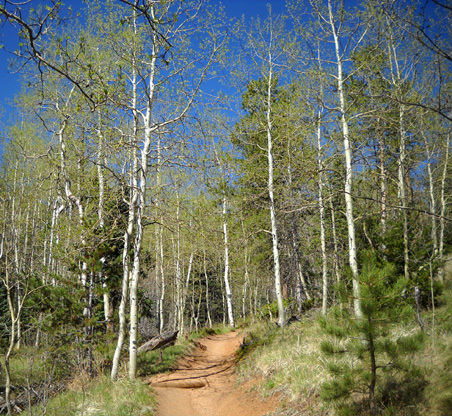 This time, I was often the faster trail user even though I was walking, not running. I caught up to lots of people walking down very slowly in front of me who were clueless about letting faster pedestrians around. The shoe was clearly on the other foot, so to speak. 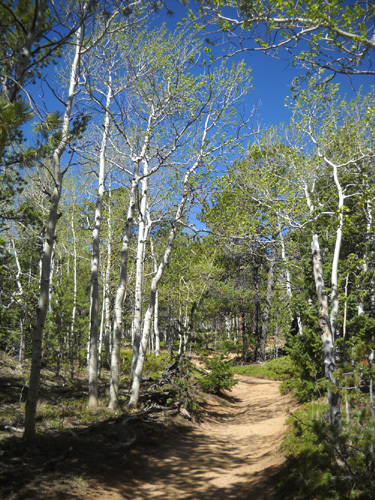 Funny how my perspective on "fast" and "slow" changed during my hike. "Courtesy" doesn't change, though. 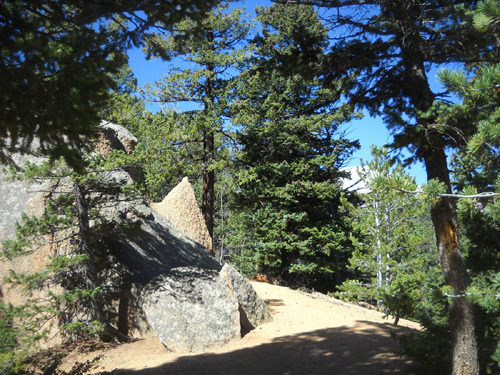 Even before reaching the tree line trail users can get some great views of Pike's and surrounding peaks on their ascent. 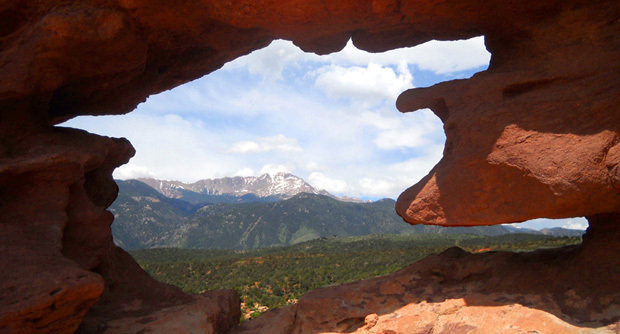 Another mountain just south of Pike's Peak also has some snow on it. 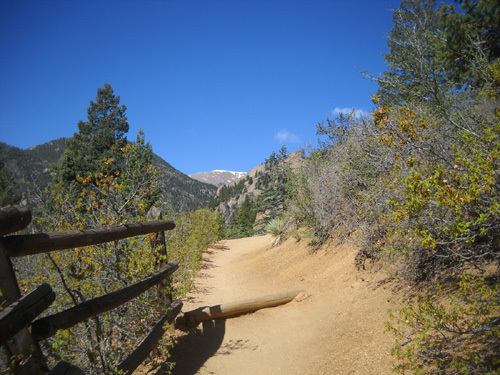 An early glimpse of Pike's Peak in the second mile up. I'll show what it looks like from the other direction when I come back down. 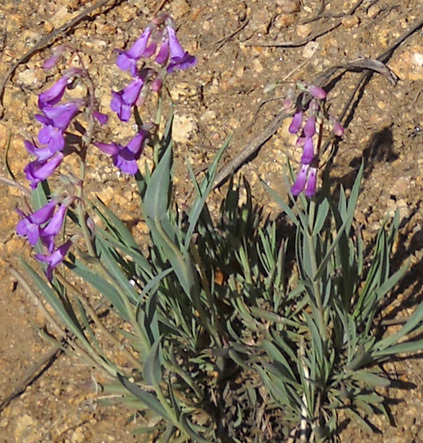 I saw only half a dozen different kinds of flowers blooming along the trail but there weren't very many of them because of the drought. The most prolific species is dandelions -- we're still in our Dandelion Time Warp!